2016 really was a tale of 2 dominant weather patterns across the Castle Rock and Palmer Divide area and we felt the full affects of both. 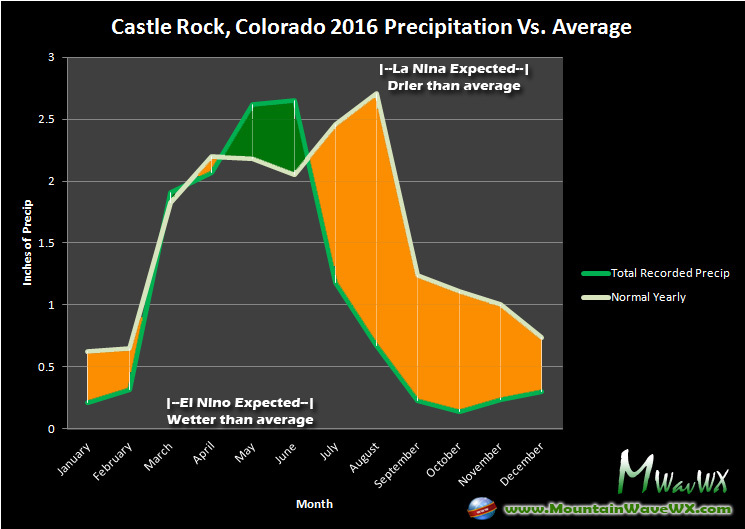 As we moved from 2015 into 2016 Castle Rock was still in the grip of a strong El Nino pattern. During this type of pattern our area typically sees a “lull” or dry period during the winter months in terms of precipitation and snow followed by a cooler and wetter spring. 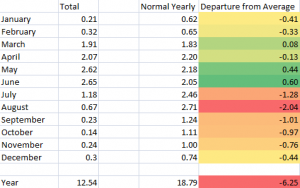 Focus on the January through June period with this graph. 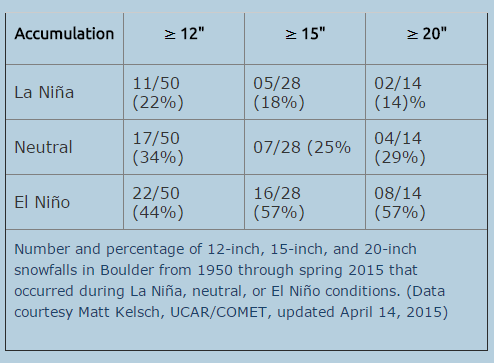 This is the type of precipitation profile that can be common during stronger El Nino events in the Castle Rock area. If you look at the winter/spring precipitation profile, you can see it match up quite nicely with the above image. 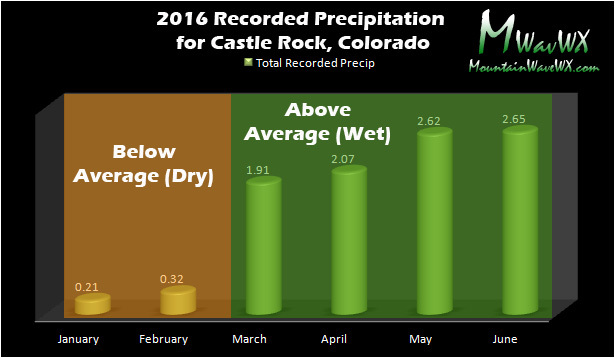 2016 started with a drier winter period followed by a wetter spring for Castle Rock. **NOTE: April finished slightly below average but still fits in with an overall wetter spring pattern. 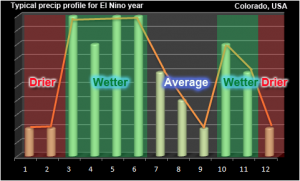 Temperatures matched pretty closely to what we would expect with a stronger El Nino pattern, these are usually characterized by a warmer than average fall and winter period followed by a cooler than average spring and early summer. The exception was a flip-flop with January marking a cooler than average temperature and February a warmer than average temperature. This little buck in the trend is not unusual as not all El Nino’s will follow a precise pattern, there can be deviations here and there. The overall data we collected was pretty sound and what we would expect from this type of weather pattern. 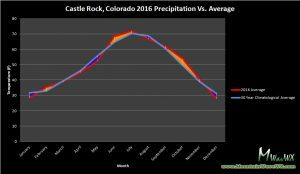 Castle Rock started the year a bit cooler than average for January but warmed up in February. A series of storm systems kept our spring cooler and wetter; this matches what we’d expect from an El Nino pretty closely. 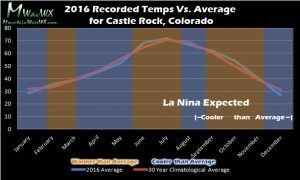 By fall we began to transition into a weak La Nina pattern, these are usually characterized by a cooler and drier fall followed by a cooler and drier winter. The weaker events of an El Nino or La Nina are a bit trickier to predict as they can sometimes behave more similarly to a neutral pattern or a weak pattern the other way (weak La Nina’s can sometimes show weak El Nino characteristics and vice versa.) Perhaps this is why we saw a warmer and drier fall; the warm temperatures often seen in an El Nino and the dryness often seen in a La Nina. 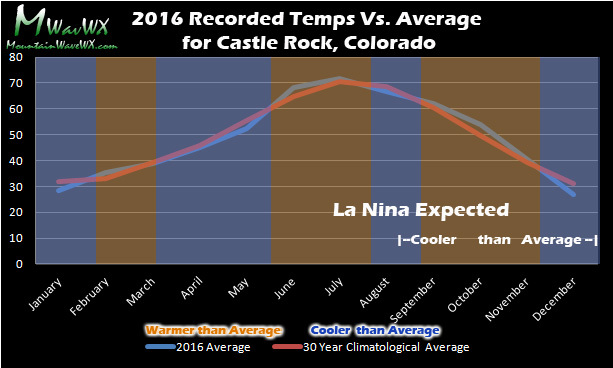 Castle Rock’s fall temperatures didn’t follow a typical La Nina pattern, it was very dry however, which is typical for a La Nina fall. 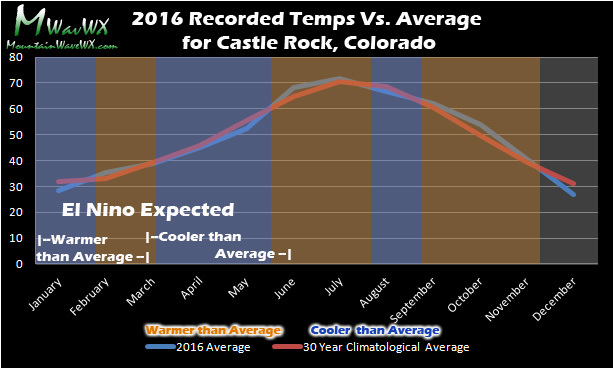 Graphical look at Castle Rock’s recorded temperatures vs. the NWS 30 year average. The graphic shows an overall close to average year in regards to temperatures with an average/cool spring and a very warm fall. Actual data recorded at our station in Castle Rock. 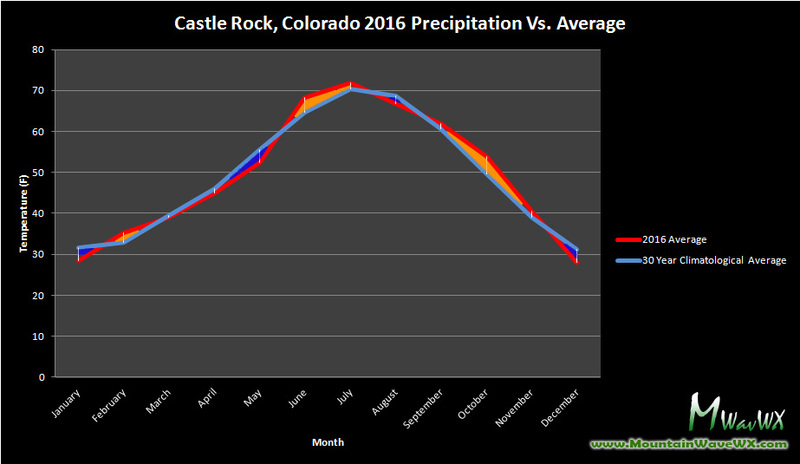 Graphical look at Castle Rock’s recorded precipitation vs. the NWS 30 year average. The graphic shows an average to wetter than average spring (exactly what we’d expect in an El Nino) and a very dry fall. The dry fall matches exactly what we’d expect in a La Nina pattern. The first half of 2016 will most likely be impacted quite a bit by El Nino. I would expect it to remain wet through late spring with below average temperatures in spring. As we reach towards summer our pattern may transition back to a more neutral state which would mean I would expect our monsoon to re-establish making August wetter than normal. The big question will be the fall and winter. Super long range climate forecasting is not my strength but from what I’ve seen on some of the longer range stuff, we could be returning to a La Nina pattern by late next year into 2017. The typical pattern seen with this setup is generally a very dry period of time. Some of our worst droughts in the past 10-15 years have come from La Nina’s following an El Nino event. Many folks will want to keep this in mind as we move into late 2016 and early 2017. Our period of wetter months may come to an end and we could see a return to drought conditions in 2017. The great news here is we got quite a few things right about 2016’s weather! La Nina did establish itself by later summer into fall, we called this but it happened a bit earlier than we forecast. We believed fall would be cooler than normal with the onset of a La Nina. This was not the case, we had a much warmer than average fall. Overall, we are happy with how our long range outlook turned out for 2016! There are indications that our La Nina weather pattern is beginning to break down as we head into 2017 and many models are predicting a return to neutral conditions or even a weak El Nino event heading into spring. I’d expect neutral conditions mainly the first half of the year and with that we could see more variable weather in Colorado’s pattern. 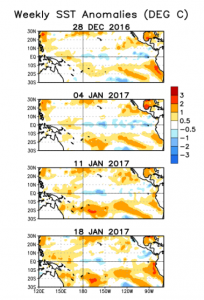 Warming water signals the end of La Nina and the transition to a more neutral pattern to start 2017. What does a neutral pattern mean for Castle Rock and the Palmer Divide region of Colorado? Simply put, a neutral pattern means we need to look at other signals in the atmosphere to figure out what might happen through the year in terms of weather. This makes long range forecasting a bit difficult as we won’t see a strong ENSO (el nino southern oscillation) pattern to dominate our weather systems. Historically, La Nina events keep us quite dry and cool during the late winter and into the spring. We have seen some of our worst droughts begin to manifest themselves early in the year. The emergence of a neutral pattern expected by the end of February means our chances for good sized snow storms slightly improve. That being said, because it is a late transition and no into a strong or moderate El nino, bigger snow storms into the spring are no guarantee. For the first few months of 2017 I’d expect cooler than average temperatures and average precipitation. As we move into a neutral pattern by March through June, I’d expect temperatures to be normal to slightly above normal with normal to slightly below normal precipitation. The monsoon should re-establish this year by late July and into August, but if an El Nino event begins to take shape we may not see this establish. I’m betting we will see some sort of monsoon event with a decent chance of average to above average temperatures. The jury is still out on the last half of the year, if we continue a neutral pattern we would expect to see near normal temperatures with normal precipitation. We have to keep an eye on that weak El Nino possibility as we’d expect a warmer but wetter fall and early winter if that pattern can get strong enough. 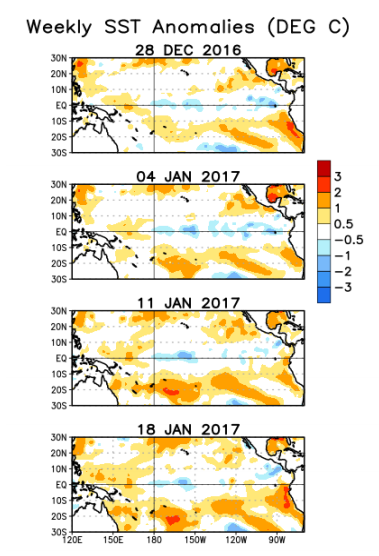 One thing I would like to point out, if you go back and look at El Nino vs. La Nina vs. 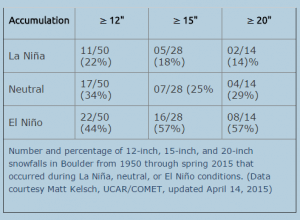 Neutral ENSO events for Colorado a handful of our more powerful snow storms have come in El Nino years, they are much rarer in La Nina years but surprisingly, there is a high amount of our largest snow storms that have come in ENSO Neutral years. So that may be something to hold on to for the snow lovers this year. Look for more long range updates and things we point out to help our long range forecasting here on Mountain Wave Weather!